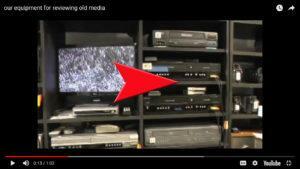 Want to preview your old media before you have them transferred? We have all sorts of VCRs, video cameras, reel-to-reel, 8-track, and record players that you can use in our Fort Collins store to preview your videos or old audio before you have us transfer it to digital for you. We also have a light table that you can use to look at negatives, slides and frames of old movie films. Not everyone wants to capture and preserve all the information on all of their old media. Do you really want that old TV show transferred? Do you really want hours and hours of your kid’s sporting events? Come in a review it before you have it transferred. If you are using the equipment ever so briefly there is no charge but if you decide to sit and stay for a spell we charge a low $15/hour equipment fee. Comments Off on Want to preview your old media before you have them transferred? How to Determine the Emulsion Side of your Slides? This post is to share with you about determining the emulsion side of a slide. All of the slides shown here are lying with the emulsion side up. The emulsion side consists of a silver halide colloidal particles dispersed in a gelatin matrix. The reason why you want to determine the emulsion side is so that you can scan or project your slides from the correct side. There are several clues to help you determine the emulsion side of a slide. The emulsion side is less shiny and has a bit of a texture to it when held up to a bright light. It is also concave or curved downward. The emulsion side often has the name and logo of the processor on it and sometimes says something like “this side toward screen”. The non-emulsion side of the slide is the side that you want to scan. It has the correct orientation of the image on it. It is more shiny and smooth. The non-emulsion side is convex meaning that it curves upward. The little mini 110 slides work much the same way but have one additional clue. There is a little window with a slide number in it that is located on the shiny (non-emulsion) side. If you’d rather not have to mess with figuring out the emulsion side of your slides you can bring or send them in to Leave A Legacy where we’ve scanned thousands upon thousands of slides and we will figure it out for each one for you, scan them and give you a digital copy. We hope that this explanation has helped you figure out the emulsion side of your slides. Comments Off on How to Determine the Emulsion Side of your Slides? Comments Off on How to Determine the Emulsion Side of your Negatives? Comments Off on How do I clean slides? This post is to share with you about cleaning negatives. The same procedure works for all sizes of negatives including: 110, 35mm, 126, APS and oversized negatives. You do not want to clean them with water as this can remove your image from the negative. 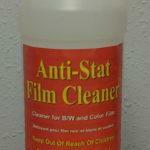 If your negatives are more dirty than that we recommend purchasing Anti-Stat Film Cleaner. It is somewhat expensive and it is rather aromatic so you’ll want to use it in a well-ventilated area. Moisten a smooth microfiber cloth with the film cleaning solution and then rub it on your especially dirty negative. You can use it on both sides of the negative. If you’d rather not do the cleaning yourself, bring (or ship) your negatives to Leave A Legacy and we’ll do the cleaning and scanning for you. We hope that this explanation has helped you learn how to clean your negatives. Watch this video to learn how to clean moldy film reels. If you don’t want to do it yourself send it to Leave A Legacy in Fort Collins. Here is our video tutorial on how to use the Eumig 2000 projector that projects 8mm and super 8 movie films either on a wall or on the enclosed “tv-type” screen. Once you view your films or even if you aren’t able to view them first, we at Leave A Legacy can transfer all of your old home movie films (8mm, super 8 and 16mm films) to DVD or digital files. We also encourage clients to view their films on our computers after we transfer them to preview them before we burn a DVD or export the digital files for them.